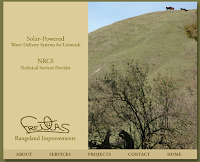 Freitas Rangeland Improvements has launched a new Web site, featuring information about their solar-powered water pumping services. Freitas Rangeland Improvements specializes in design and installation of solar-powered water pumping systems. They introduce water to remote areas of rangelands to open the door for better distribution of livestock, increased efficiency in forage utilization, wildlife habitat improvement and wetlands restoration. For more information about Freitas Rangeland Improvements, contact Jed Freitas at (925) 580-6415 or jed@jedfreitas.com.